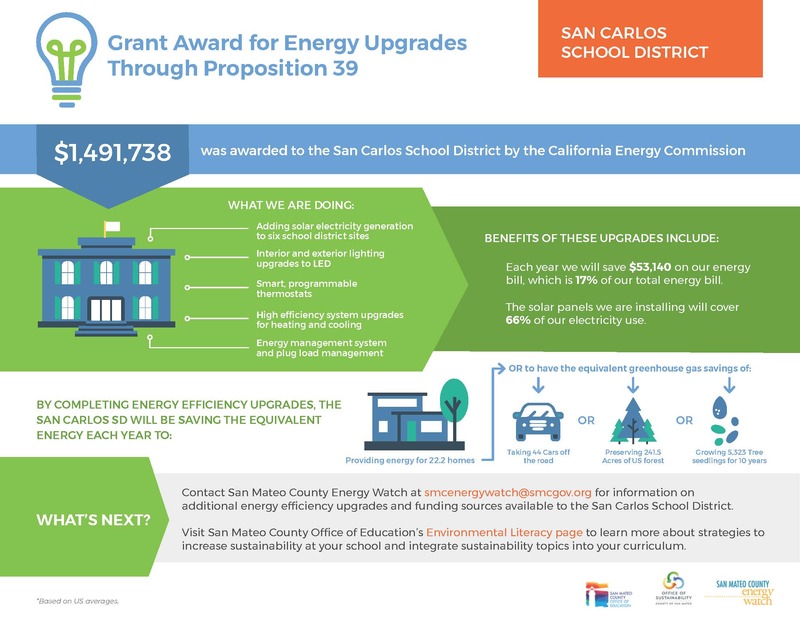 Over $1 billion in state revenue is now accessible for schools throughout the state to implement energy efficiency upgrades through California Proposition 39 (Prop 39), a ballot initiative passed in November 2012. SMCEW supported 20 school districts in the county by providing energy audits and assistance with writing and submitting Energy Expenditure Plans (EEPs) needed to access these funds. As a result, 20 out of the 22 K-12 school districts in San Mateo County submitted EEPs and were approved for Prop 39 funding! When applying to this grant, our mission was to save on operations costs to provide budget for school programs, develop a healthier and more comfortable learning environment, and reduce the GHG impact of the district and improve air quality. Computer rendering of rooftop and carport solar installation at Central Middle and Arroyo School that, when completed, will offset 100% of the schools’ energy consumption. Construction on the project is set to start in 2018. Learn more about our programs or how to get an Energy Audit for your facility.